THIS is why I am soo very excited about the upcoming MONSTER JAM Monster Truck show at the Metrodome on Saturday, November 13th! 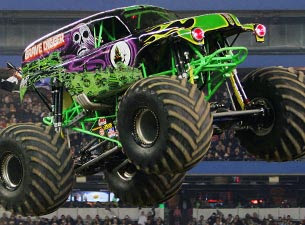 That's right ~ four tickets to Monster Jam at the Metrodome in Minneapolis for November 13th to give away to one lucky reader of Gust Gab, courtesy of Feld Entertainment! Oh man Darcie!! Donovan would freak out if he even knew there was a monster truck show! He's obsessed with a monster truck video and I actually hid it up high to just take a break from having him beg to watch it for a while!! My Greta Nephews would LOVE LOVE LOVE their Auntie!! If she took them to this! P.S. AND I follow your BLOG!!! I liked your Gust Gab on FB!! I'm now officially a Blog follower too! Here's my daily comment and here's to trying to score myself some awesome free tickets! Well, of course, I missed a day of posting my regular comment. I'm back on track today! Here's another wonderful, pointless comment from me! Only 1 week until the drawing! I kind of feel like a weirdo being the only one that posts something...that's okay cause it's for a good thing! omg! my boys would go NUTS for this!